Chicago Montessori School | Park View Montessori School in Chicago, Illinois – Happy Children Make Happy Parents! Orientation to the Montessori environment. 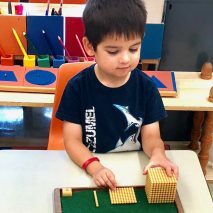 Introduction to the Montessori teaching materials, toilet training, and preparation for the social and academic experiences offered in Preschool. Complete Montessori environment emphasizing refinement of movement and academic growth. Prepare your child for the transition into a traditional classroom setting. The Enrichment Class engages and inspires students to seek life-long learning by offering continuing inspirational teaching and a focused curriculum. Park View Montessori School in Chicago is located on Irving Park Road at the cities beautiful lakefront. After more than 20 years in this location, we encourage to continue the development of the whole child: the academics as well as the physical, the personal as well as the social. Indoor and outdoor activities support the development of a healthy mind in a healthy body. Park View Montessori supports the child as she prepares herself, not only for elementary school, but for life. Daily group lessons provide opportunities for community building. Small group activities promote turn-taking as well as problem solving. The outcome of the Toddler plus three year Preschool experience is a child who has been treated with respect, and deals respectfully with self and others. She enjoys successful interactions with children and adults, and has acquired skills to help deal with the give-and-take of daily social interaction. She has an authentic appreciation of liking herself, and can feel able to meet challenges that are part of daily living. Your child experiences an environment that is prepared with everything needed to develop orderly work habits, fostering task analysis, problem solving and decision making. Your child’s attention span will broaden and deepen, supporting good study habits. Your child will prepare the hand for writing and train the eye for reading. Large motor activities promote strength and grace. Your child will learn to work without needing constant adult supervision. Self-sufficiency develops with everyday tasks like fastening clothes and preparing snacks. Your child will have daily opportunities to learn about the importance of following through on choices and working on an activity to its conclusion. Experience leads to contributing the community and helping others as needed. Your child will have abundant opportunities to meet, interact, and make friends, and practice the skills that enable successful social give and take. Your child’s interactions with the environment encourage the development of vocabulary and reading skills, and the formation of math concepts. Your child’s experiences lead to self-knowledge and a strong self-concept. Your child will develop inner discipline and composure. Real life water activities like Dish Washing, Small Muscle Manipulative Exercises, Art, Individual Snack, and Line Time. Material and activities developed by Dr. Montessori to educate and refine the senses, to become careful observers and strengthen judgement. MATH: Concrete and Conceptual 1-10, Decimal System, Processes. SCIENCE: World of plants and animals. GEOGRAPHY: Study of our home the Earth. HISTORY: The passing of time. FINE ARTS: Experience music and visual arts.